It rains as we pull out of the lodge at 7:30 a.m. Not a hard, pounding rain, but drops speckled across the windshield of the Rogue. I don’t notice the temperature until Warm Creek – 38◦. 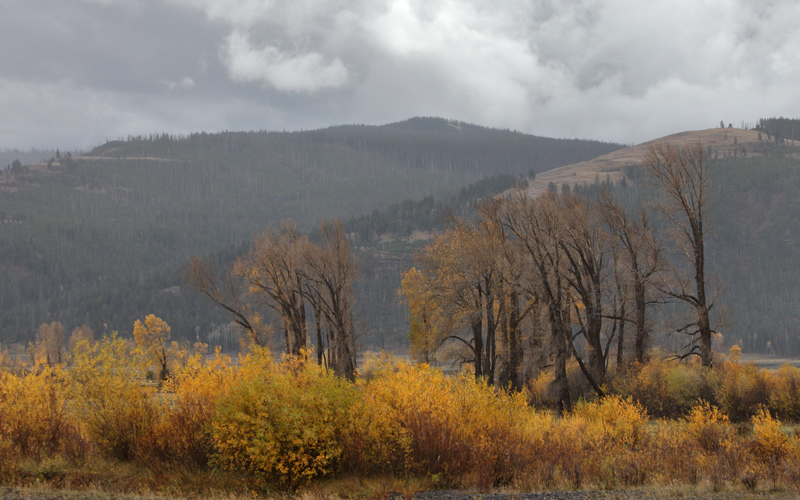 Aside from bison grazing on slopes sheltering the valley, Lamar Valley is quiet. A few vehicles park in turnouts spread out along the road. Antelope graze here and there, white tails giving them away. The Valley seems empty. 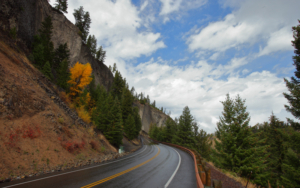 Then we pass through Lamar Canyon toward Slough Creek where vehicles are parked on either side of the road down to the campground. Some of the Prospect peak Pack wolves are in the creek bed – three blacks and one gray – and it seems like they are moving west. 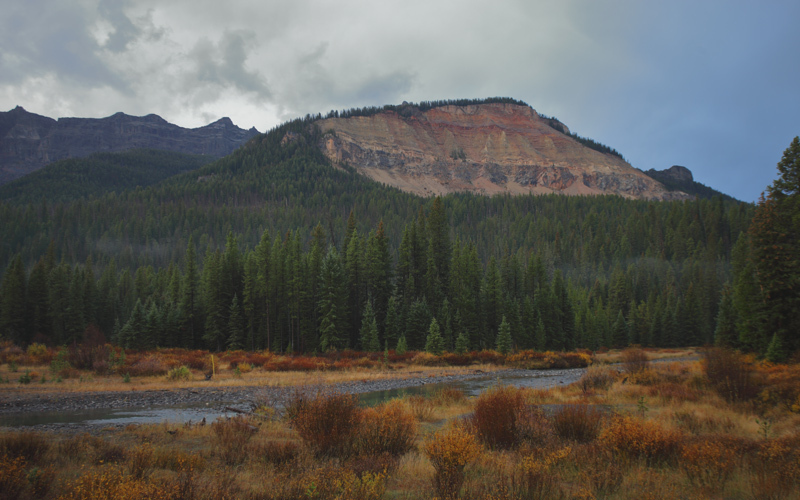 In an attempt to second guess the wolves we drive west and they cross the river behind us, sending us back and forth from Aspen turnout to almost the Specimen Creek Trailhead. 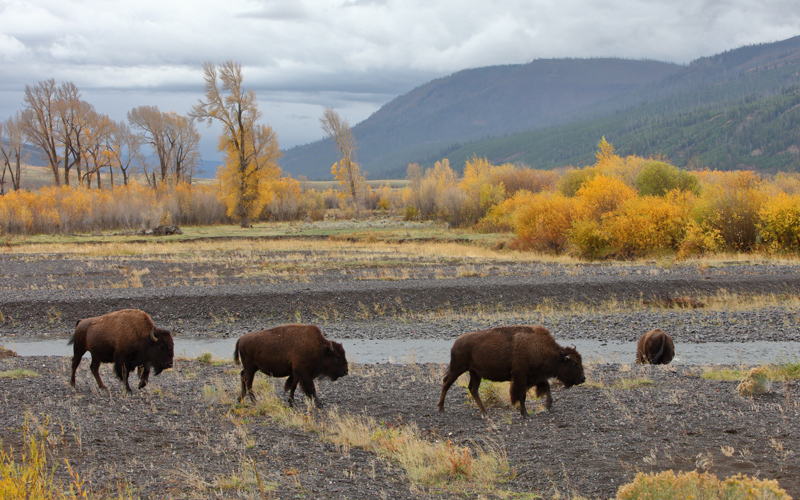 Five wolves make their way through a herd of bison toward the Peregrine slopes. Three blacks and two grays are close enough to see with the naked eye and they are not in a hurry. One black and one gray are collared, assumed to be 996M and 964M of the Prospect Peak Pack. 996M sits up on a ridge and stares straight at us. This group has splintered off from the main pack, not necessarily permanently. 964M and 996M especially appear to be looking for mates. In the middle of September they attacked and killed 911M, the alpha male of the Junction Butte Pack. Some think 996M is positioning himself to take over the Junction alpha role, much like 993M and 965M did in the Lamar Canyon Pack. All five meander through sage up the rocky slopes of the Peregrines, until they are out of view. We drive to the other side of the hills where two blacks trot through the grassy flats and then bed on top of the hills. All this in the rain until we can barely see them. Clouds hover over us all day, trailing us east to west and west to east as we try to escape the rain. 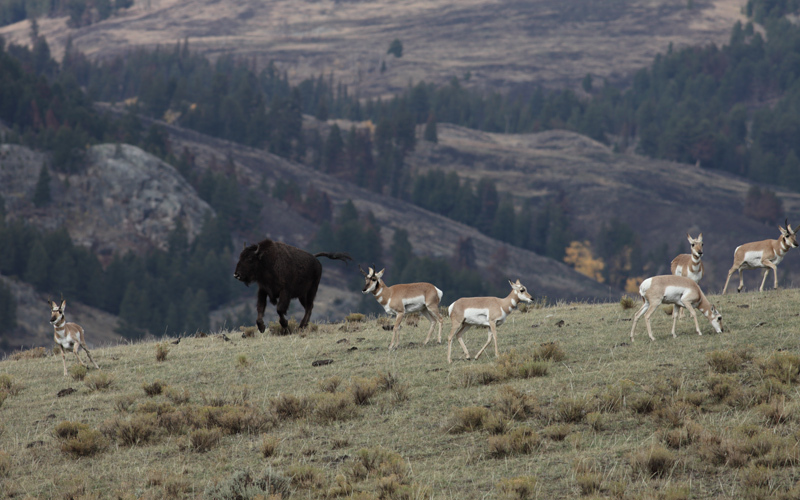 Two coyotes hunt in tall, yellow grass at the base of Junction Butte, carefully watched by a herd of bison. The sun comes out at Tower, revealing a beautiful view of the Yellowstone River. We are tired of being in the car, hopping out any place where we wouldn’t get drenched, so at Hellroaring we try a short hike to the suspension bridge. The trail is slick and muddy in places, but doable, and the view of the river is spectacular. Dark gray clouds roll in quickly; after the steepest descent we hear thunder. This is not the place to get caught in a storm, especially with a camera. Time to turn around and race up the trail. We drive through rain to Little America where we stop to watch pronghorns grazing near a herd of bison, three bucks and three does. A buck that appears older chases off one of the others, running after him, pawing the ground and stamping his hooves. Then he circles the area marking territory. 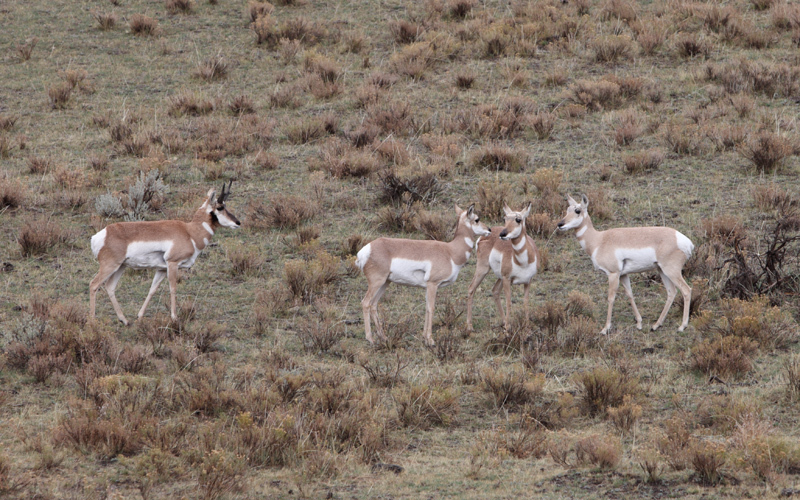 This is the first time we have noted courting behavior like this in a pronghorn. 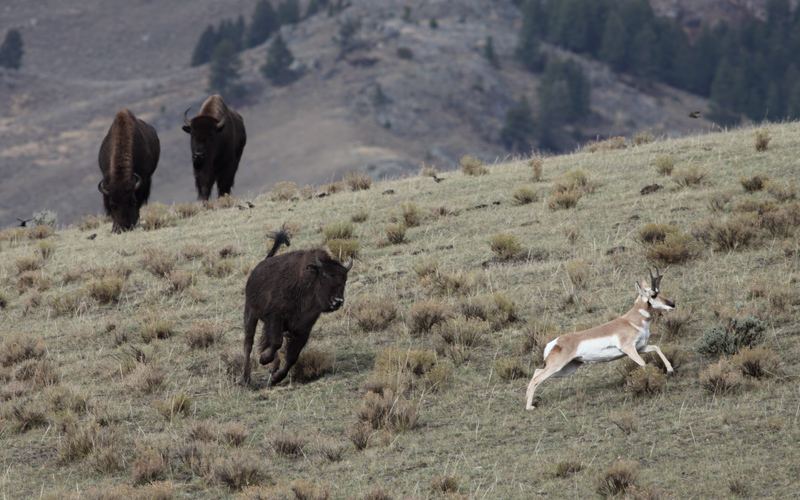 A bison bull watching the chase copies the pronghorn, lifting his tail and loping down the slope after the pronghorn, then running in circles, sending the bird that was on his back soarng into the air. It rains on and off the rest of the afternoon, stopping for fifteen minutes, continuing for twenty. We walk down the path to the Lamar River from Fishermans, crossing the rocky river bed to the water’s edge. We stop and listen to the water rushing over the rocks. Rain begins in earnest and we head back to Silver Gate. Even in fading light the valley glows with the fiery gold of aspens.